Mountain High’s 2014/15 Season Pass is the best value in Southern California and beginning August 30th, anytime season passes are on sale for up to 64% off. The Wrightwood Resort is also offering Young Adult & College passes to help students save even more. For as little as $249 (Regular $699) guests can enjoy an entire season of skiing and snowboarding at Southern California’s closest winter resort plus track their days ridden, number of days, vertical feet and more. Seniors age 70 & over receive a FREE season pass and children ages 6 and under receive a FREE season pass with the purchase of an adult season pass. 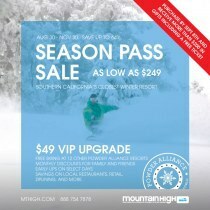 Visit http://www.mthigh.com/season-pass-sale for a full listing of prices and benefits including Mountain High’s $49 VIP Upgrade. Pass holders from the previous 2013/14 season who renew by September 8th receive the aforementioned benefits plus another $50 off the Adult, Young Adult, and College rate. Season Passes are good any day or night the resort is open during the 2014/15 season with no restrictions. Regularly $699, these passes are on sale from August 30th to November 30th, 2014, for as little as $249. For avid skiers and snowboarders they are the best way to save money and pay for themselves in as little as 5 visits. Children’s passes are available as well. Click here for a complete listing of prices and benefits. http://www.mthigh.com/season-pass-sale Passes may be purchased online, at the resort, and by phone at 888 754 7878. Please note there is a $10 processing for all new passes purchased including senior and children 6 & under. For more information or to schedule an interview please contact John McColly, CMO, at (760) 316-7803 or john@mthigh.com. Mountain High is Southern California’s closest winter resort located just an hour and a half from Los Angeles and Orange County. The area consists of three separate mountains (Mountain High East, West, and North), and offers a wide variety of lifts and trails, a world-class terrain park, an outstanding Winter Sports School, and the region’s largest tubing area. Night skiing and snowboarding is available 7 nights-a-week peak season and snowmaking covers more than 80% of the slopes. Mountain High has been the first resort to open in Southern California for the past 17 years and traditionally operates from mid November to mid April. Get more at mthigh.com.